Spoiler warning: this article divulges key plot points, surprise twists, and the film’s ending. You should not continue reading if you haven’t seen the movie. 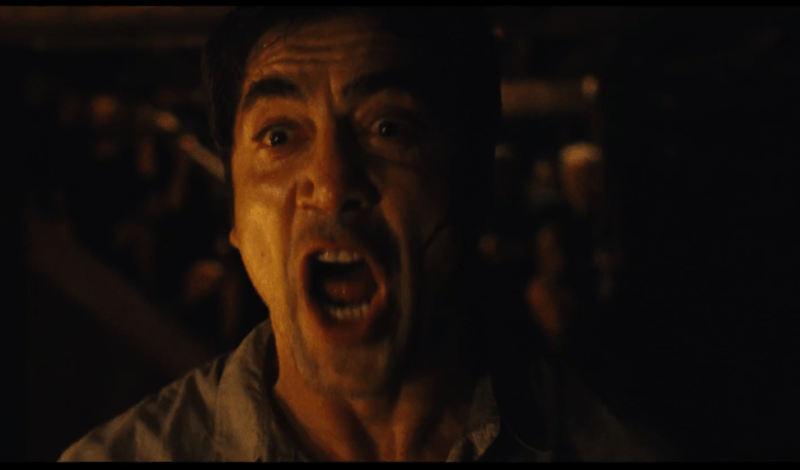 There is no score in mother! It’s as quiet as our theater was when the credits rolled. My friend and I instinctively broke into applause, and everyone else defiantly did not. I’d call mother! divisive, but with audiences giving it an ultra-rare F, “unifying” might be a better word. My heart breaks a little for Jennifer Lawrence in all this, because mother! marks her third big bust with audiences in as many years. Probably because people are so pissed, she and director Darren Aronofsky are scrambling to explain mother!‘s meaning in the media today, and I wish they wouldn’t. Sure, I picked up on the Biblical allegories (they’re fairly on the nose), but apparently that’s all Aronofsky meant to do with this movie. I would have sworn it was about so much more. This raises a more important question about movies, their meaning, and who ultimately “makes” both those things. To get into that, I’d like to walk through what I found to love here — the things I excitedly rambled about to my friend on our way out of the cinema (and the things that Aronofsky apparently hadn’t intended at all). Note: the characters don’t get names, so I’ll use the actors’ instead. We sense that something isn’t quite right when Ed Harris shows up at Jennifer Lawrence’s door that first night, and so does she. Everything inside her screams not to let him in. But she trusts Javier. And he, apparently, trusts Ed. As it turns out, both their trust is misplaced, and it invites unimaginable chaos into their home. This is the danger of trusting others, of letting people into our lives. If we must talk in Biblical terms, it’s the lesson of being unequally yoked. And it’s illustrated in horrifically impactful fashion during the first half of this film, when things haven’t quite gone bonkers yet — when we still trust Aronofsky to eventually explain everything and tie up his many narrative threads. As it turns out, that trust will be violated too. Lesson learned. There is a cyclical rhythm to mother!. The same thing keeps happening. I tried to get a sense of where the cycle begins and ends, and I started to sense a connection between chaos and birth. Both protagonists are artists. Javier makes poetry; Jennifer uses paint and restoration to make “paradise” out of a rebuilt home. They bother offer their art to a public too. Javier’s poems go to his publisher and eventually a mass audience — devoted fans who soon turn his beautiful words into a rallying cry for melee. Jennifer’s art gets a “wide release” all its own in the form of thousands of strangers helping themselves to her hard work, plopping down on unframed sinks and snatching bits of molding as souvenirs. Like anyone who’s spent more than a day inside a film studies class, I have built-in antennae that go haywire anytime anything “meta” creeps onto a screen. “A-ha!” I thought. “This is Darren Aronofsky talking about his experience of making art that the public later destroys.” Apparently this is not what he had in mind. Nevertheless, I’m taken by the notion that neither of these artists stops creating after the ruinous reception of their most recent works. They do it all over again. In fact, ruin seems to be the very thing lighting their spark. Javier starts writing again on the night a man is killed in his house. Jennifer is impregnated on that same night (pregnancy long having stood as a metaphor for artistic creation). Nine months later, she’s remodeled the house again. And then she and Javier each give birth on the same night: her baby, his book. And that’s when chaos strikes again. This is the cycle of the artist: make something intimate, release it to the public, allow the public to wrest ownership of it, and then start all over again. Why? That seems to be one of the central tensions at play in mother! It doesn’t take Jennifer long to realize she needs to escape. But she can’t. Because the power in her home is entirely her husband’s. “We want you to leave,” she tells Michelle Pfeiffer. Later, she implores Javier to tell their guests to go. “They’ll listen to you!” she cries. She’s right. They would listen to him. But they won’t listen to her. She has no social power within that world. And so she resigns to imprisonment in her own home, where she’s made especially vulnerable by a condition her husband can’t know: pregnancy (and later, motherhood). I woke up this morning, and the first few headlines I read were about North Korean defectors fearing the next nuclear move, terror attacks in London, acid attacks on the streets of France, and… an 11-year-old boy being “treated” to the chance to mow Donald Trump’s lawn? I couldn’t help but think about the funeral scene in mother. 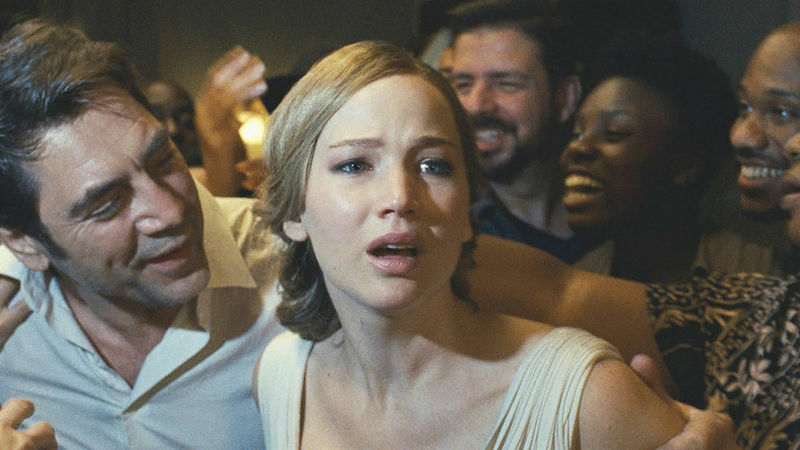 Aren’t we all J-Law, looking at a world gone mad around us and wondering why no one else is making it stop? If helplessness is a horror, then the horror in mother! feels very fresh indeed. Oh Yeah, and Some God Stuff Too..
Look, I’m always game for a good Bible allegory. My favorite Narnia books are The Magician’s Nephew and The Last Battle. And I get what’s going on here (kinda). Javier is God. Jennifer is Earth. Her house is Eden. Ed is Adam. Michelle is Eve. Their kids are Cain and Abel. The glass rock is the forbidden fruit. The baby is Jesus born in Genesis or something. Kristen Wiig is… well, I don’t understand everything, okay? All of this is interesting to me. I think it mostly works. Aronofsky’s understanding of God isn’t mine, but I’m hip enough to Hollywood not to be surprised by that. So it’s fine. But this whole allegory thing simply isn’t what I’m here for. One of the first lessons we learn about movies is that directors make them, and we either like them or we don’t. As a film student oh so many years ago, that was also the first thing I had to “un-learn.” It’s the single hardest thing about “reading” film, the single biggest idea that turns general audiences off from academics and film critics, and also the thing that ultimately led me to really fall in love with movies. In a literal sense, directors (and other filmmakers, working as a team) make movies. But in an equally important and real sense, audiences make them too. It has to be that way because if a movie doesn’t mean something to you, it doesn’t mean anything at all. Your only sense of meaning is the meaning you make. And you make it out of the symbols the filmmakers put together for you. This is the thing that makes film communication. It’s a back and forth, a bargained-for exchange. Directors put together signals and symbols, and we decode them. Some of those signals are easier to read than others, maybe because the filmmakers choose to attach their “signifiers” to easily decoded “signifieds.” Others are more abstract. The more abstract the symbols, the more likely it is a movie will mean something different to me than it means to you (or to the filmmakers). It’s probably no coincidence that the four major themes I found in mother! are themes I spend a lot of time thinking about in my own life. I don’t expect they all occurred to anyone else in exactly the same way. Perhaps you had equally meaningful but altogether different readings. Or maybe you hated its guts (the way I do Black Swan‘s). That’s okay too. Whether we “like” a movie or not is ultimately an arbitrary checkmark (admittedly, I’m predisposed to this particular cast and to creepy old house stories, not to mention surrealist excess) — what’s interesting is why and how we got there. I hope I’ve managed to share some sense of how I got to loving mother! and what it means for me. Maybe it’s fitting this movie comes on the heels of “The Summer of Twin Peaks,” an exceedingly cryptic and frequently frustrating art project that nevertheless fascinates me with the themes it explores by way of mood and vignette. I may never fully understand what’s happening in mother! or Twin Peaks, but they’ve both given me frames of reference for exploring these same themes in other works — and in my own life — for years to come. Film has many purposes, but I see this as one of its highest. In that sense, mother! is one of the most rewarding movies I’ve seen in a long time.